How long have you been with the ministry? THE ministry, or this one? I’ve been involved in the business of church for a good long while (I even taught karate for a church, long story), and have been with Hour of Power for a couple years now. 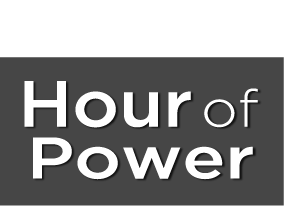 What do you do for Hour of Power? Right now, I research, invite, coordinate with, and host the many wonderful guests our church and program has every week, as they interview and perform for our congregation and viewers around the world. How did God bring you to the ministry? I met Robert Laird while working in that mice-infested theme park down the road, who asked me to come in for an interview after establishing a good friendship through his website, dapsmagic.com. I fully expected to spend the rest of my life working at Disney, but the Lord’s plans don’t always line up with theme-park-filled expectations. After prayerful consideration and a lot of conversation with my wife, I left the dream job for something better. Being odd has been at my core since I figured out that I didn’t want to be a farmer for a living. Back then, “odd” meant not being in 4-H or the Future Farmers of America, but I digress. Here, I have the space to be odd, while still being accepted and appreciated. Do you have an impactful story to share from your job? I don’t know about this being impactful on a grand scale, though the time I got to host a personal hero from my youth around on a Sunday certainly sticks with me. He even invited me to his show following his visit, and gave me an experience 13-year-old Cameron wouldn’t have ever dreamed possible. The impact wasn’t just because of the amazing time, but because it’s one of the last things I’d have expected to be able to do through a church! This is a different place, and I like different. I like rebuilding antique vending machines, eating things I can’t pronounce, and making what sounds to be pained cat noises on my banjo. And yes, I know I sound like a tertiary character in a quirky indie film. And I’m okay with that. Clever stand-up acts like John Mulaney and Bo Burnham get a lot of play. Also, Supernatural. I don’t need to validate that decision. Snarple, because it is not currently a color offered by Crayola, and therefore can only be found with out-of-the-box thinking. There, I did a clever thing. Did you see? I gave 2 friends your book”The Beloved. These are their comments which they posted in their Facebook ” Try to get this book, it’s a keeper. Many of the insights herein have tremendously helped me during my most difficult times. Thank you Ning F. for getting this book for me” Eliza, missionary from Albania and” Finally, just finished reading it. Like other book he wrote (Happiness according to Jesus and Imagine Happiness ) I became more and more soaked with the feeling of how much I’m beloved. It was awakening, encouraging and hopeful. Again, I feel so blessed the whole time as I’ve been reading this great book. Thank you! Thank you!” Hewon Kim RN, Palos Verdes, Ca. I praise and thank God for using your book to bless my friends.